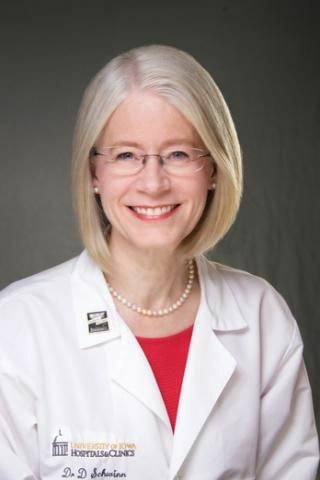 Debra A. Schwinn, MD, is Associate Vice President for Medical Affairs and professor of anesthesiology, pharmacology and biochemistry at the University of Iowa. She is a member of the Institute of Medicine, Association of American Physicians, past Chair of the Board of Trustees of the International Anesthesiology Research Foundation and Board of Trustees of the Sarnoff Cardiovascular Research Foundation. Her molecular pharmacology laboratory focuses on mechanisms underlying α1-adrenergic receptor regulation and modulation in cardiovascular disease, including the biological effects of genetic variants of these stress receptors. In parallel, over the last few decades, her clinical studies have focused on perioperative genomics, a relatively new field aimed at identifying genetic variants that predict increased risk for perioperative adverse events. Prior to moving to the University of Iowa in 2012, Dr. Schwinn was professor and chair, of anesthesiology and pain medicine, Allan J. Treuer Endowed Professor in Anesthesiology, and adjunct professor of pharmacology and genome sciences at the University of Washington in Seattle. My decision to study medicine is an interesting and complex story. When I was young, I planned on becoming a professional violinist. At the last minute, during winter of my senior year of high school, my father sat me down and asked the following question: “How are you going support yourself as a musician when you get divorced?” This question caught me off guard since I was 17, certainly not married or engaged, and all of my music conservatory applications had been submitted and auditions scheduled. I was in that awkward “in-between” place of not knowing if, or where, I would be accepted. I believe my father asked this question because he cared and wanted to ensure his eldest child had a financially sound plan for her future. Upon reflection I believe that if I had pushed back, my father would have supported a music career. However the question made me stop and think seriously about my future and whether I would be happy training in music at the highest level, which would have eliminated serious study of most of the other academic subjects I loved. So after a week of soul-searching, I made the decision not to go into music after all and cancelled my conservatory auditions. My other academic love was chemistry, and I was accepted at a small liberal arts college in Ohio that had an excellent chemistry department -- the College of Wooster. As a chemistry major, I had originally planned on graduate school in order to earn a Ph.D in pharmaceutical chemistry, physiological chemistry, or pharmacology, and ultimately decided that medicine would be a nice combination of those areas. So that’s how it started. What were a few key steps in your journey from an aspiring medical student to your current position as Associate Vice President for Medical Affairs at the University of Iowa Roy J. and Lucille A. Carver College of Medicine? After completing a chemistry degree at The College of Wooster in Ohio, I attended Stanford University School of Medicine. It was there I was introduced to the Medical Scientist Training Program (MSTP) where students combine MD and PhD degrees. Two of my medical school anatomy team members were MSTP students from Yale. This piqued my interest in research because I hadn’t realized that physicians had the option of training deeply in biomedical research in order to have careers as physician scientists. At The College of Wooster every student is required to complete a year and a half of research and a thesis, so I was familiar with the hard work, disappointments, and joys of bench science in biochemistry. Once I realized I could do both, I was hooked and did not look back! However, rather than joining the MSTP program during medical school, I decided to complete residency training and then pick a relevant area of biomedicine for further clinical fellowship and basic science research training. I matched to the anesthesiology residency program at the University of Pennsylvania where there were strong researchers on the anesthesiology faculty. The University of Pennsylvania has strong academic medicine overall, so I observed many physician scientist role models in the ICU, internal medicine, anesthesiology, and surgery (and a host of other basic and clinical departments). After residency training was completed, I looked for a clinical cardiac anesthesiology fellowship combined with basic science research training. My husband moved to Duke University for his Ph.D. in New Testament, so I completed a year of clinical cardiac anesthesiology and then five years of laboratory research at Duke University Medical Center. The research Principle Investigator who I trained under, Bob Lefkowitz, MD, went on to win the Nobel Prize in Chemistry in 2012. My years in his laboratory were filled with watershed moments. I learned not only from Bob and other senior faculty, also from (and perhaps most importantly) all the other colleagues in the lab; there were twenty to thirty people in his laboratory at various levels of training (MDs, postdocs and PhD graduate students). I eventually started my own laboratory, funded by the National Institutes of Health and other national organizations, and continued on the faculty at Duke for more than twenty years. I loved the combination of basic laboratory and clinical research, together with clinical patient care, especially the use of interdisciplinary approaches in each area. There is nothing like sitting in a clinical conference and recognizing basic science connections and visa versa – this illustrates the important value physician scientists bring to medicine. What made you choose cardiac anesthesiology as your specialty? The human heart has always fascinated me. One of the reasons I decided to train at Stanford University School of Medicine was because the medical center had a heart transplant program in the early 1980s as well as strong cardiology and cardiac surgery. Anesthesia had never crossed my mind as a possible career prior to medical school, however I loved studying physiology and pharmacology, and those form the foundation of anesthesiology. The subspecialty of cardiothoracic anesthesiology combines the best of all these worlds. Indeed, anesthesiology covers acute care aspects of all of medicine, ranging from the intensive care unit and operating room for elective surgeries, to unexpected trauma patients, assisting in delivering high risk babies, head injury, cancer, pediatrics, chronic/acute pain, etc. There are days when as an anesthesiologist I came home saying to myself, “You know, I really made a difference today.” That was really important to me in choosing a specialty. In anesthesiology one also gets an opportunity to interact with patients at a time when they are scared (just before surgery or a procedure), and therefore very “real.” Providing information, reassurance and comfort in these times makes working with patients very meaningful. Physician scientists who become administrators often continue to treat patients (albeit in selective ways), sometimes run a research laboratory/project and/or teach, all in addition to performing their administrative duties. Fundamentally, medical school administration supports the three-fold mission of academic medicine – teaching, research, and patient care. Administrators therefore must have deep knowledge in each of these areas of medicine, and particularly how they interact, in order to make the best possible decisions for a given institution. Tapping the wisdom of the faculty, staff, and trainees at all levels is crucial in ensuring leaders make the best decisions possible. When I was a medical student, I remember seriously considering each specialty within medicine because each has its own wonderful parts. I particularly loved the intensity of specialties such as cardiology, cardiac surgery and surgery in general, as well as differential diagnosis puzzles and the critical thought processes learned in internal medicine, pathology, and some aspects of pediatrics. Fortunately anesthesiology combines acute care medicine, critical thinking and diagnostic puzzles, and the operating room. Because I finished all of my required medical school courses in three years, I was able to complete my clinical electives as a terminal graduate student in the Los Angeles area where my husband moved to complete seminary. Exposure to different institutions, and how they do things, allowed me to distinguish between dogma and general consensus in medicine. Overall, I treasure the outstanding teaching I received at the University of Pennsylvania in anesthesiology. In addition to very early (6:30am) daily formal lectures my first 2 months of residency, faculty members regularly taught in the operating room. Sometimes the teaching would take the form of practicing emergency situations. These challenges never put patients at risk, yet they challenged the resident/trainee. For example, I remember once I was in the operating room on a Saturday “call” rotation and the faculty turned the oxygen to the operating room off from outside the room; the point of this exercise was to see if I would turn on auxiliary oxygen tanks located on the anesthesia machine in the operating room as was protocol for this emergency situation. The faculty and senior residents watched the patient and monitors through the door, ensuring all parameters of oxygenation and patient stability remained 100% normal. Would I notice the situation they had created when bells and whistles on the anesthesia machine started going off? How would I react and deal with the emergency? How did I dean with the surgeons asking: “What is going on?” Would I turn on the oxygen tanks immediately? Such practice scenarios were/are crucial in drilling handling emergencies correctly, and are invaluable lessons one never forgets. Given your multifaceted research interests and duties as Associate VPMA, how do you balance cutting-edge research, clinical care and administrative duties? Academic medicine is a hard driving, high-paced career, yet one that is also very rewarding. It takes a lot of experiments, controls, and repetition in the research laboratory before breakthroughs occur, and yet finding new information that may ultimately help patients is extremely satisfying and energizing. Creating new teaching methods, and then testing them rigorously for efficacy, is hard work, yet seeing trainees (students and residents) able to learn nuances of patient care even more effectively is very satisfying. The same can be said about clinical care where studying new clinical therapeutic approaches is not for the feint of heart, yet seeing patients do better by having more effective treatment options is wonderful. As a leader of a complex academic medical organization, one has to have expertise in each of these areas, yet be at a point in one’s career where supporting others to perform the cutting edge work is the goal. It is no longer about your own personal career, rather moving the institution forward in creative and sustaining ways that is ultimately important. Tapping the wisdom of faculty, trainees, and staff in this process is crucial. One thing that I have learned is that while physicians tend to be good at “doing” in medicine (e.g. competence and productivity), being “present” (relational leadership) is crucial as well. Both of these important aspects of leadership are integrally intertwined in the most effective medical school leader. When applying to medical school, students often ask themselves: “Where can I get into medical school,” as if this was the final question. Each medical school has a specific character, “feel,” and areas of expertise. Matching your goals and interests in life with the area of strength of a particular medical school is crucial. It not only facilitates your entry (because the school tends to recognize your strength and experience as important), it is a good fit in terms of thriving as a student long term. For example, if you are interested in clinical informatics, there are some medical schools that now have informatics tracks, either at the level of medical students and/or residents/fellows/junior faculty. Other schools have deep science (basic and clinical) research experiences within their four-year medical school curriculum. Others may focus almost exclusively on rural and/or family medicine training as a pipeline to meet the need of their state and/or region of the country. Some medical schools offer a combination of expertise areas. At the University of Iowa, we have a fantastic rural clinical medicine program, yet our students also have the opportunity to engage in deep research exploration (as a top 30 NIH-funded medical school), international health experiences, and even a new distinction track on health care delivery science and management (to name a few programs). Iowa is also a smaller medical school, with slightly over 1000 faculty, so students get more individual attention. As a result of these options, we (at the University of Iowa) have a great deal of experience in matching student interest/passion to our various programs. To summarize this entire section, my strong advice is to look beyond hoping to simply gain admission to medical school, to exploring more deeply nuanced areas of “fit” in terms of strength of a particular school/institution and your interests. I am a firm believer in personalized medicine, now most often called precision medicine. Over the years, clinical trials have demonstrated overall efficacy of most drugs currently on the market. Now that we have genetic information available, knowing whether genetic data exists that make it likely an individual will be a responder to a given drug is very helpful to the health care provider in designing treatment strategies. While this is most often thought of in the context of cancer therapeutics, many diseases can now be approached using these same tools. In this context, genetics is an increasingly important area of expertise for physicians (and the public) to master; genetics counselors help our patients tremendously in this regard. It is interesting that we live in a world today where our every movement is tracked by GPS systems in our phone and/or car, results of our morning workouts are emailed to us and posted on social media by some, progress through one’s day can be tweeted, posted, or archived, and yet privacy remains an appropriate concern. In this context it is important to remember that while our DNA is very influential in alerting us to predisposition to disease, it usually does not guarantee that a disease will (or will not) be active during our lifetime. This is because once we know we are at risk for a given disease (e.g. lung cancer) we can make proactive choices designed to decrease risk (e.g. not smoking for any reason); thus knowledge may lead to actions that decrease disease incidence, rather than increase as sometimes presumed. Remember that precision medicine is only one part of many new medical diagnostics and therapeutics. Much work is still needed to understand increasingly sophisticated basic biological pathways of disease in order to identify new treatments. In this regard, research investigation is refocusing on human physiology. Over the last 30 years or so we have utilized wonderful animal and cellular models that have contributed greatly to our understanding of diseases. However animal models do have limitations (e.g. humans have a very distinct immune system that cannot always be mimicked using non-human models; this is increasingly important to understand in an era where harnessing the human body’s innate immunity to fight cancer and other illnesses is crucial). In addition, new areas such as nanotechnology have power to transform medical care. So remember to keep a wide perspective on biomedical science since there continue to be new and exciting developments! I think this is a “yes and” answer; it is not an either-or situation. Taking a step back, most of us recognize that it is important to keep our entire population as healthy as possible from birth to death; that ultimately saves money and enhances the quality of life for everyone. As a country, we need to literally “keep moving” -- this includes walking, regular vigorous exercise, and perhaps riding a bike to work. At the same time, there are individuals who are currently sick and need treatment. Both are important. Public health and medicine, as well as all the other health science disciplines, must join together to delivery a coherent and strong message in this regard. Newly emerging health care teams may be a great platform to delivery “both and” health care. Medical education is changing as health care delivery changes. While many comment that we are still modeling medical school after Flexner’s report from 100 years ago, with 2 years pre-clinical science and 2 years of clinical training, most medical schools have now creatively integrated many parts of medical education across all 4 years. Lots of medical schools have realized that physicians need to be more than simply excellent clinicians to be effective leaders of health care going forward, so this is being addressed in varying ways across the country. I personally believe that an ideal medical school would allow flexibility for a student to graduate with an MD/MS if they wish, still in only 4 years, with the MS in an area of the students passion related to medicine. For example, there is a crucial need for physicians who understand information technology and informatics deeply, as well as other important areas such as public health and/or basic research, etc. In terms of practical differences in today’s medical schools, there are fewer and fewer lectures. Rather, the “flipped classroom” is becoming more of the norm. In this model, students are expected to have read material prior to coming to class so that the material can be deepened with clinical case presentations and discussion. These are very positive changes. A few schools are also exploring three-year medical school, however that may not be the best route forward since it focuses on training to the bare minimum needed to be clinically competent, not necessarily what will be needed by students (outside of clinical medicine alone) for their future. Because medicine continues to change rapidly, it is crucial to ensure medical students master being life-long learners.